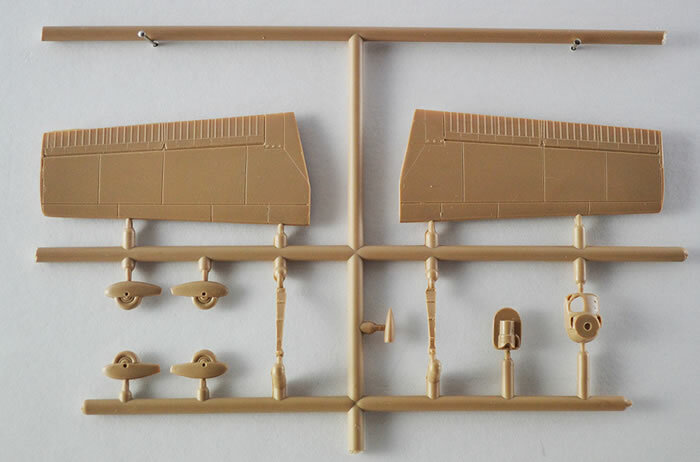 2 sprues of tan coloured inject moulded parts, 2 resin wheels, a clear canopy, decal sheets and instructions. 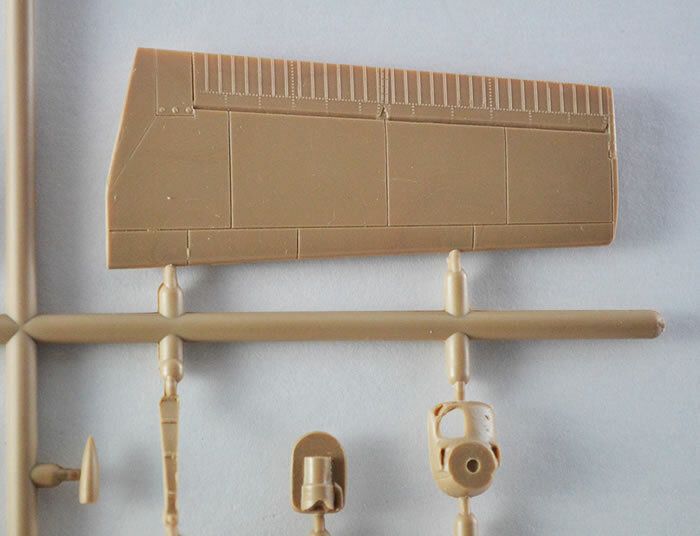 Clean, moulding with very little flash, good detail, nice clear canopy . Seat belts are show is Step A of construction but there are neither photoetch or decals for these….mmmm…confusing! A great little subject with some really good schemes not previously released by anyone. 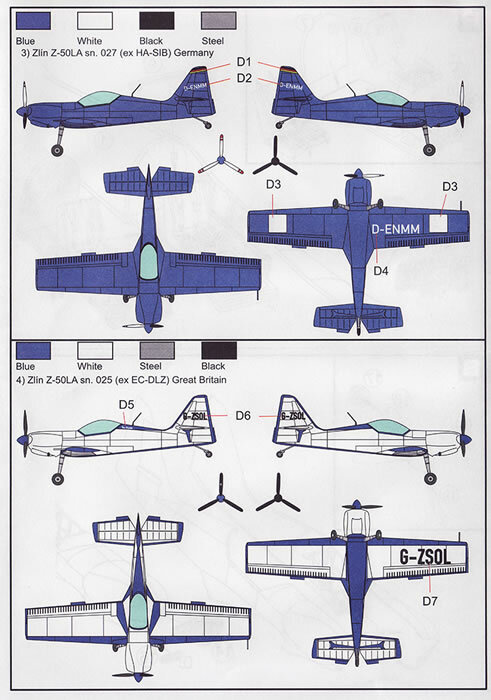 The Zlin Z-50 is an aerobatic sports airplane built by the Czechoslovakian company Zlin Aircraft. 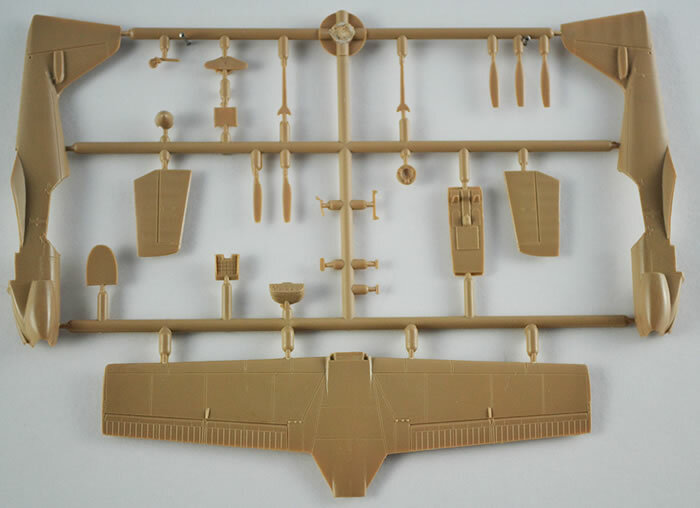 In autumn 1973 it was decided in Moravan Otrokovice to develop a new single seat aerobatic airplane. The design team was headed by Jan Mikula, a noted Czech designer. During the design phase, computer optimization was used to achieve the desired aerodynamic characteristics. The principal goal was to determine the optimum engine and propeller combination for this aircraft. Designers settled on the Lycoming AIO-540 D4B5 horizontally-opposed six-cylinder piston engine, rated at 194 kW (260 hp), driving a three-blade Hoffmann constant speed propeller. The prototype Zlín Z-50L (L for its Lycoming engine), with civil registration OK-070, first flew 18 months after the start of design work, on 18 July 1975. The first flights were successful. 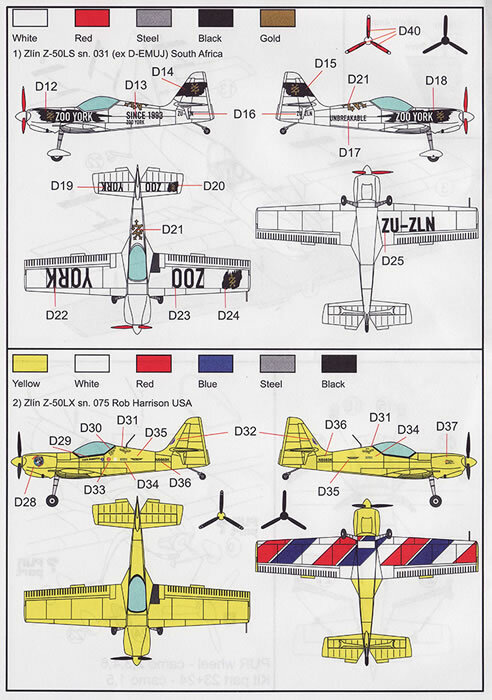 The Z-50L is a cantilever low-winged single-engined monoplane with a fixed tailwheel undercarriage. Unlike the Zlín Z 26 series which it replaced, the Z-50 was of all-metal construction, with limit maneuvering load factors of +9.0 and -6.0. It does not incorporate landing flaps; in their place, two-section ailerons extend the full wingspan, providing an exceptional rate of roll. The designers made ample provision for trimming: automatic trim tabs are used on the inboard aileron sections; on one of the elevators and on the fabric-covered rudder; one outboard aileron has a ground-adjustable trim tab; the elevator has a trim tab which can be adjusted in-flight. The standard fuel capacity can be supplemented by wingtip auxiliary tanks for ferry flights. 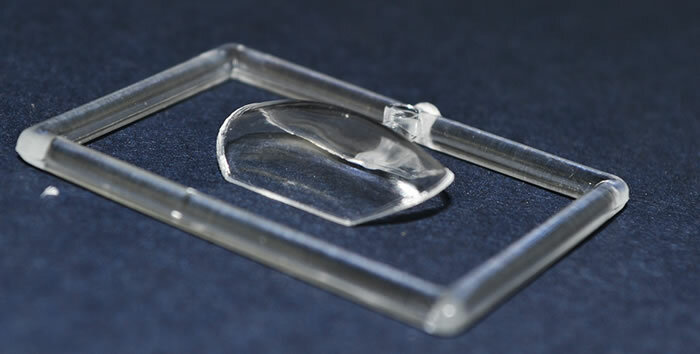 The full-vision bubble canopy can be jettisoned in-flight if necessary. The Zlín Z-50 made its competition debut at the 1976 World Aerobatic Championships, being flown by both the Czechoslovak and Polish teams, with a Czechoslovak Z-50 finishing in third place (behind two Soviet-flown Yakovlev Yak-50s), while the Czechoslovak team finished in second place in the team competition. 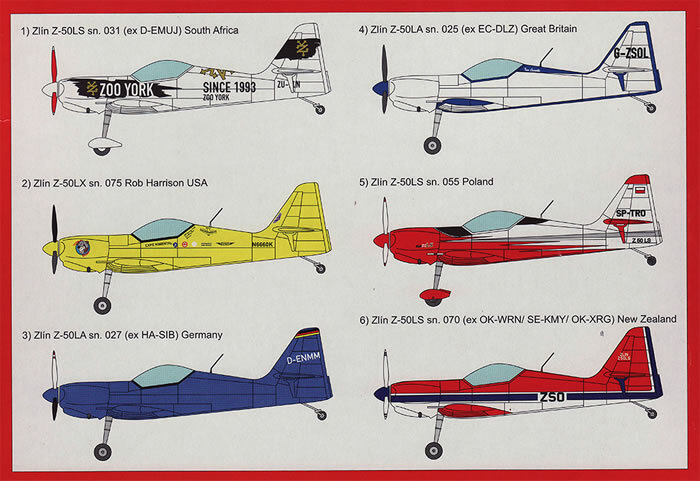 In the 1978 championships, the Zlín was more successful, with Czech-flown Z-50s finishing first and third in the individual competition, and a German-flown Zlín finishing fourth, with the Czechoslovak team winning the team competition. Zlín Z-50s finished fourth in the 1980 championship, and third in the 1982 competition. The Zlin Z-50LS, with a more powerful Lycoming AEIO-540 L1B5D engine of 224 kW (300 HP), was first flown by Zdenek Polasek on 29 July 1981. The more powerful engine enhanced vertical maneuvers. 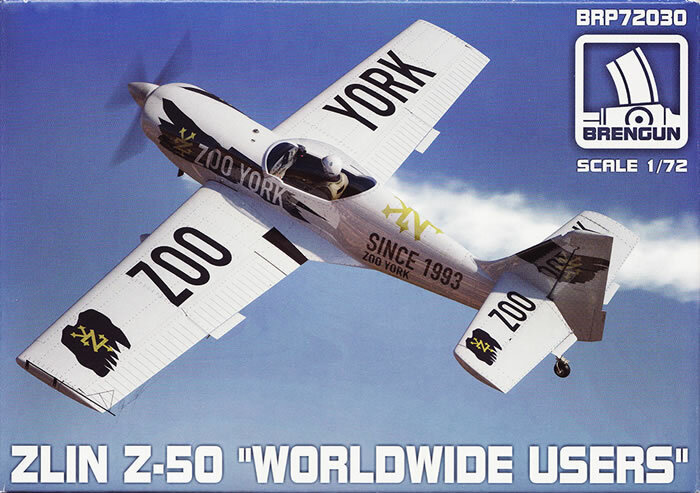 The Zlin Z-50LS can fly at 760 kg gross weight in the aerobatic category (+8g to –6g). Many Z-50L and LA versions were rebuilt to Z-50LS standard in the early 1980s. 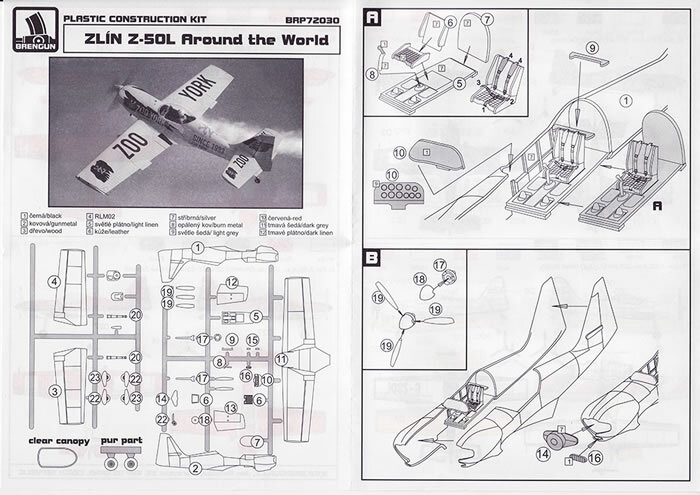 A Z-50LS won the World Aerobatic Championships in 1984 and 1986, but the debut of the Sukhoi Su-26 in the 1986 eventually edged out the Zlin from world-class competition. Firstly the kit comes in a relatively small end opening box. Be warned, this is a small model. 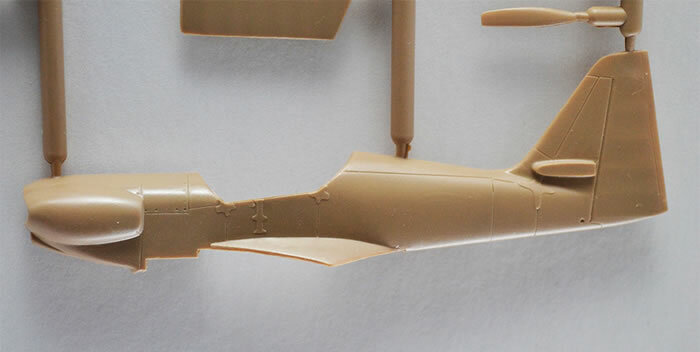 The actual aircraft is small so in its scale form it’s really small, in fact, it nearly feels like a 1/144 type model. 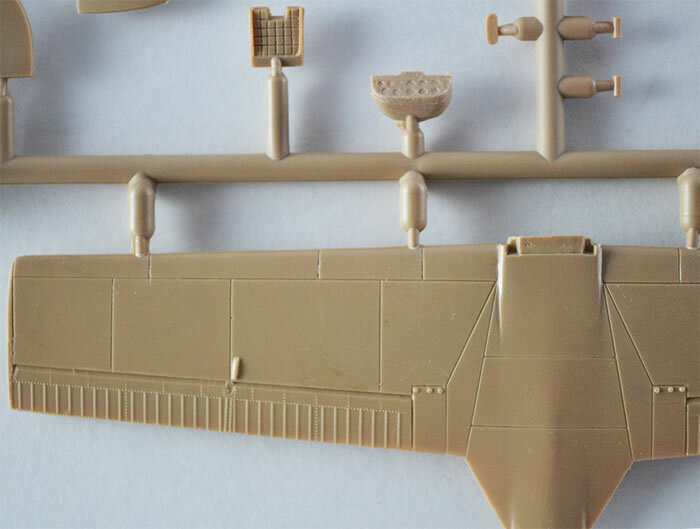 There are 2 sprues of tan parts containing 37 parts of which 4 indicate that they are not used. They have been moulded cleanly with excellent exterior detail and have little flash on them. The canopy is very clear. 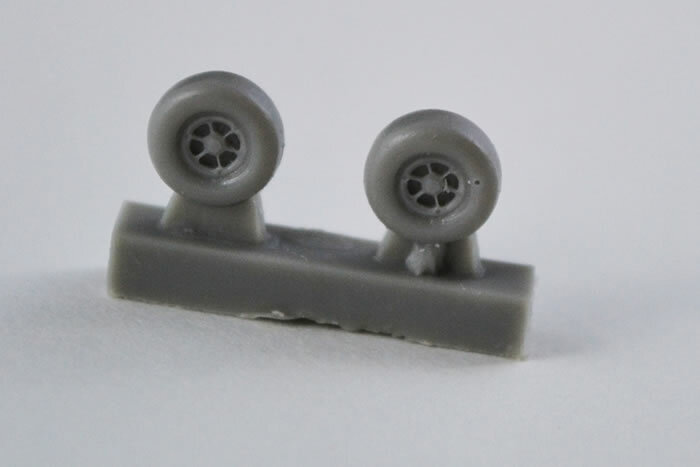 The two resin cast wheels have lovely detail on them. The set of instructions are printed on one extended sheets the size of 3 A4 sheets joined. The reverse side has colour schemes for 6 different aircraft used in 6 different countries. 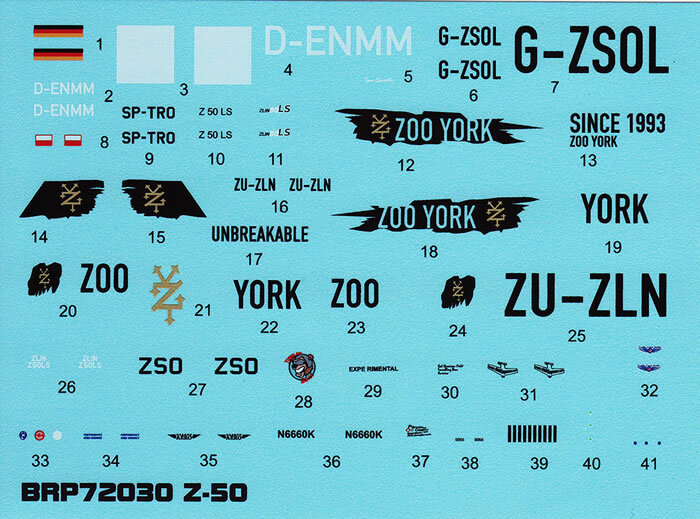 There is a small sheet of decals with serials, and artistic type graphics but none of the colour bands etc. These will need to be masked, which, with the intricate nature of several of the schemes will be an interesting task with the small size of the model. 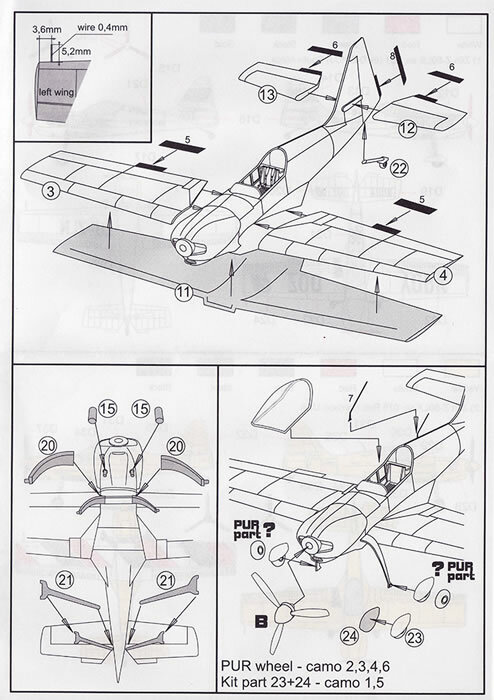 My only real negative comment on this kit is that Brengun indicate seat belts in the first step of construction but they are not in the kit in either photetch or decals which with the large clear canopy is quite disappointing. A very neat little kit of an interesting subject. 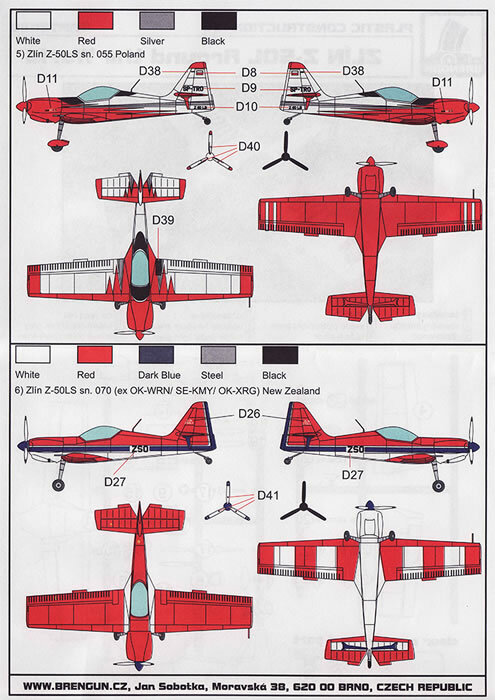 The Zlin Z-50 is a very nice looking aircraft and with the choice of 6 really varied colourful schemes, will make this a nice addition to the collection. Thanks to Brengun for the review sample.